Thirty plus attendees had come from as far afield as Colchester for a practical insight into the use of social media for businesses. A brief summary of the presentations and useful links and keywords arising in the meeting are given below. Richard Wishart, Delivery Management, concentrated on the intensive use of social media to forge contacts and participate effectively at events, giving practical examples and a detailed account of how he incorporated social media as a vital ingredient in his business development. Richard's additional strength was his background in technology and insatiable appetite to see what the new tools would be. Google+ is the new kid on the block and it was very useful to see the features and hear about their strengths and unique selling points contrasted with more established media. Chris Thomas, Milton Contact, introduced social media as a natural extension of physical networking, giving an insight to the ease and time required to make entries in short posts such as twitter, participate in groups and discussions in Linkedin and to write informative blogs. Two key elements were the 1. the interconnected use of different social media to complement each other and 2. the ability to collate media streams either in your personal online newspaper (using paper.li) or in Hootsuite (online) or Tweetdeck (device based). Desiree Ashton, Virtual PA, reminded us of the incredible speed in which the social media had penetrated into social and business consciousness. Continually keeping ahead of the game was essential so that she could assist her clients to make that jump from the small goldfish bowl to the larger one in the world-wide web. Established blogger and networker, Ann Hawkins, The Inspired Group, rounded off the afternoon by chairing the discussion and questions in a friendly and approachable way. Ann reminded us of the key element of using social media, the reintroduction of fun into a business environment. Where else could you gain an insight into the interests and personalities into the aspects that are most important in any business, the people who make it work. The final question was on measuring the return in investment in social media. The beauty of using online social media is that they do permit the collection of real data, not just in terms of connections but also in linking preferences or success in redirecting to relevant sites. Ultimately, the ROI is a very individual aspect for each individual and company. 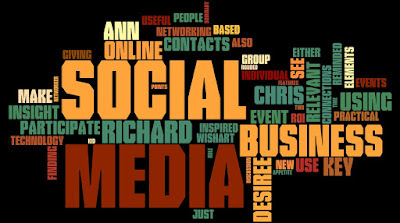 The ROI depends on the aims and objectives for using social media. Whilst for Chris it is a matter of increasing online presence, for Richard it is finding key contacts, connections and most importantly, creating opportunities between interested parties in his technology sectors. Desiree's key role is finding social media solutions that are appropriate for and tailored to her business contacts and Ann's in building an internet based, positive community that could also participate in her Inspired Group networking events. Below are some of the main elements and keyword reminders of the topics covered in this excellent event, with the contact details of the people who made this event possible, either by presenting or ensuring it's effective organisation. Check them out - and if you like what you see, connect! Great post, Chris, and a really insightful rundown of the event. I especially liked your anecdote about stained glass windows which highlighted one of the hidden gems that lie at the heart of social media - the intention to connect and communicate authentically. So much of the social media sphere is used and abused by those who are simply looking to out-shout the others. Thanks for taking the time to write a useful and informative post. Did you know that you can shorten your links with Shortest and make money from every click on your short links.